The most polarizing title of 2010 will get a follow up. Deadly Premonition made headlines in early 2010, but it wasn't due to overwhelming acclaim or universal panning - it was a mix of both. The horror title received some of the most remarkably varying ratings of any game in recent memory, and whether you loved or hated it (or loved to hate it), the franchise's creator Hidetaka Suehiro wants you to know that he's not finished. Speaking with the PlayStation Blog, Suehiro - who often goes by the singular moniker "Swery" - explains that he's currently in talks for a followup to the polarizing title, though whether it will be a true sequel is yet to be determined. "I'm in discussion with Tomio (the producer of the first title) about the future of Deadly Premontion," Swery reveals. 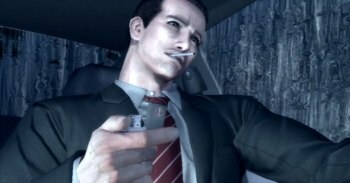 "It may not be Deadly Premonition 2 but it's definitely going to be something. At the moment we're talking about how it might be interesting to set the game in Europe." The original Deadly Premonition, which was a 360 exclusive, scored in the high 60s on Metacritic, but that score doesn't adequately explain how much the title split the critics. For example, many publications scored the game in the high 80s - with Jim Sterling even offering a 10/10 in his Destructoid review - while others such as IGN bashing the game with scores as low as 2/10. PS3 owners in the U.S. and Europe will get their first chance to experience Deadly Premonition this coming April in Deadly Premonition: The Director's Cut.